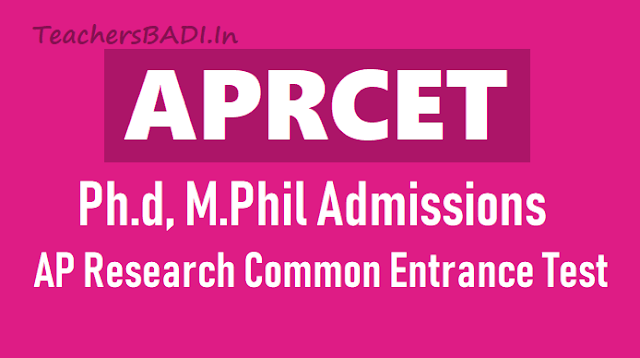 APRCET 2018 Ph.d, M.Phil Admissions (AP Research Common Entrance Test): Andhra University to conduct APRCET-2018. The Andhra University, is conducting Andhra Pradesh Research Common Entrance Test (APRCET) for the academic year 2018-19. Based on the test the admissions will be given into PhD and M.Phil programmes for both full time and part time candidates in 14 Universities in the state. The APRCET test will be conducted in 73 subjects. Andhra Pradesh Research Common Entrance Test, APRCET 2018 is scheduled to be conducted by Andhra University from August 22 to 24, 2018. The online application for the same had commenced on July 7, 2018 and is to conclude on August 6, 2018. Interested and eligible candidates who aspire to seek admission to full-time or part-time Ph.D or M.Phil. courses from 14 universities, research centres and affiliated colleges present across the state of Andhra Pradesh can apply for AP RCET 2018 on the official website, sche.ap.gov.in. Steps to apply and the direct link to the APRCET 2018 online application has been given below.The last date for online application submission with a late fee of Rs 2000 is August 11, 2018. A provision of correction of online application data already submitted would be given on August 12 and 13. APRCET 2018 hall tickets would be made available for download from August 16, 2018, onwards. The application fee is Rs 1440 for General and OBC category. Steps to apply for APRCET 2018: Log on to sche.ap.gov.in. Click on the purple-coloured tab saying AP RCET – 18 Research Common Entrance Test. Alternatively, click on the direct link given here. Detailed APRCET notification can be read here.Click on Application from the top menu. Make fee payment first and then proceed towards the Online application. Enter all the needful information, upload necessary documents and submit the online application form. Print the application form and payment receipt for future reference. The Detailed notification would be issued on June 30 and commence of the online application forms from July 4. The last date to apply through online mode is August 6 and also late payment fee of Rs.2,000 can apply August 11. The hall tickets would be issued from August 14 to 17 and examination would be conducted from August 22 to 24. The eligibility criteria for admission to APRCET (admission into M.Phil./Ph.D. programme) is the candidate should have a Master's degree or a professional degree declared equivalent to the Master’s degree by the corresponding statutory regulatory body, with at least 55 percent if marks in aggregate or its equivalent grade 'B' in the UGC 7-point scale. Those who are waiting for result of PG Degree can also apply for APRCET 2018. But they have to full fill the required criteria at time of interview. The fee structure for APRCET 2018 is Rs. 1,400 for General and B.C. and Rs. 1000.00 for S.C, S.T and PWD candidates. "APRCET Exam Date: 23, 24, 27, 28-08-2018"
The examinations would be conducted for 180 marks. In two parts. The Pprt-A is in the teaching and research aptitude for 90 marks in 90 minutes, whereas part-B is in the subject specific for 90 marks in 90 minutes. There would be 1/6 negative mark for each wrong answer. Qualified Candidates in the Entrance Test would be called for interview/viva-voce by the concerned University eepartment where the candidates are required to discuss their research interest through a presentation before a duly constituted committee. Interview is for 20 marks. "APRCET 2018 Hall tickets from: 14-08-2018"
Commence of the online application forms from July 4. APRCET Exam would be conducted..